Global Business Today, 2nd Ed. technology and convergence "A powerful force drives the world toward a converging commonality, and that force is technology"
Physical books and publications would be expensive to print in different languages, and it would be challenging to determine how many companies you should print and bind in each language. If the product was a sofware file that could be downloaded from a website, once you have the translations done, you could have a variety of different language versions downloaded and the only cost would be the bandwidth for the downloads. Points The North American/Euro-centric approach to marketing textbooks means that some applications of what we dicuss may not apply to some of the emerging markets in other regions of the world. India, despite its rapid growth in technology and science, still has cultural and social circumstances which are centuries old and have a continued effect int he new millenium. "BusinessWeek's 2002 top three brands are Coke, Microsoft and IBM (the value of the top three brands range from around $69 billion to $50 billion). 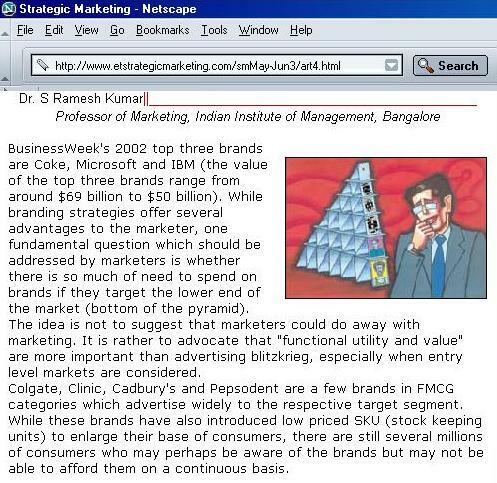 While branding strategies offer several advantages to the marketer, one fundamental question which should be addressed by marketers is whether there is so much of need to spend on brands if they target the lower end of the market (bottom of the pyramid)... The Indian population is classified into destitute class, climbers, aspirants, consuming class and the rich. The consuming class (which has an annual income between Rs.45000 to Rs.245,000) has around 32-35 million households and destitute class and climbers have even a larger base of consumers. There is a huge presence of unorganised markets in almost every category. Tiger (Britannia) in biscuits, perhaps MTR in ice-creams in Bangalore and A-1 in tea are brands which have successfully addressed themselves to the lower end of the market. Given the low-level of income and the flow of income (daily and weekly salary distribution), there is a greater need to address the lower end of the market and the focus shifts to product dimensions rather than the communication dimension. There is a need to research habits, beliefs and consumption patterns so that appropriate offerings could be developed." interview with Rishad Tobaccowala, President, Starcom MediaVest Group IP. He was picked by Time magazine as one of the world’s top five marketing innovators. 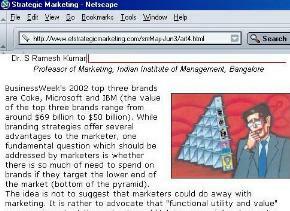 "How is today’s marketing communication on the Internet different from the time of the dotcom boom? There are three big differences this time. Firstly, this time round it’s starting off with an adult mindset where people are looking at the Internet and digital media as part of marketing; rather than hoping for it to take over all and eliminate all other forms of marketing. Second, it’s starting off with a much larger base than five years ago. As per US statistics, 60 per cent of all households have access to the Internet, close to half of those have access to broadband Internet, and therefore, they also tend to use Internet 12-14 hours a week. The third difference is that people are beginning to realise that the future is going to be impacted by digital marketing. So for instance, there’s a lot of interest in personal video recorders (PVRs) like Tivo and Replay which are currently present in around 2.5 million homes in the US. But it’s all about how consumers control their television. So marketers are saying, if you want to learn how consumers are controlling media, then we should pay a lot of attention to the Internet, because that’s where they control media!" " In which markets is the most innovative digital marketing happening? "The most sophisticated market when it comes to broadband and Internet penetration is South Korea. If you talk about digital gaming, ie households that have a Sony Playstation or Microsoft Xbox, then those tend to be in Japan and the US. When it comes down to telephone-based digital marketing, then it’s Scandinavian countries, some parts of Europe and Japan. When it come to digital music, then it’s the US and what we anticipate is that with digital TV, it will again be the US and the UK. We expect that with everything that’s built around broadband or the internet, India will catch up very fast. Even when it comes to digital music, India will catch up fast because it’s computer-based and connected to the internet, and digital video recorders will come in here in a big way. "